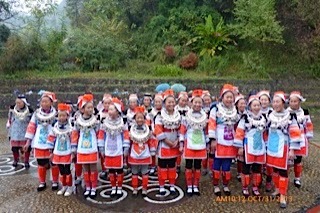 I just came back after leading a group of 20 through the southern and southeastern regions of Guizhou. 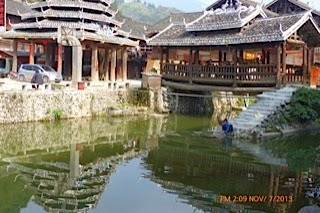 This is the part of Guizhou that is full of ethnic minority villages and enclaves. In addition to the great diversity of people in colorful native apparel, the rugged terrain of Guizhou offered spectacular scenery. It was the most fun and fascinating trip ever for my fellow travelers and me. Lots of people do not know where Guizhou is. Even many Chinese don't. It is a landlocked province in southern part of China, one of the least economically developed regions of China. With the tourism boom going on in China, Guizhou will become a future hot destination, first for domestic citizens within China and then later for western tourists that have already been to the popular Beijing/Shanghai/Xian/Guilin circuit. and Xiaoqikong (seven small arches) Scenic Area in Guizhou. Both are world-class attractions and the good news is that these areas are being managed in a way consistent with their world-class status. In other words, only park service vehicles inside the park, designated walkways for visitors, conveniently located trash and recycle bins, and relatively odor free restrooms. 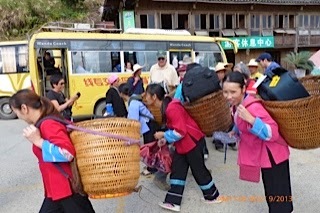 We walked through villages belonging to Miao, Dong, Buyi, Shui and Yao people. We even stayed in Zhaoxing, a town with five clans of Dong people. 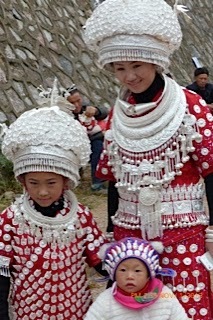 We learned to tell the difference between the long skirt, short skirt and mushroom Miao people by their costumes. We even went to a Gejia village where the people are striving to be recognized by the central government as a distinct ethnic group and not as a branch of the Miaos. The displays in the Gejia museum claim that they are descended from northeast corner of China and Hou Yi, the legendary hero who shot down extra suns in the sky and saved earth from a scorching demise, as their ancestor. Hou Yi is a legendary figure that also has a place in the Han Chinese folklore. By oral tradition, the Miaos believe that they migrated southward from the Yellow River basin before recorded history when their forefathers lost the battle to Huangdi and his coalition of warriors and were forced to vacate their farmlands. Since Huangdi is the legendary founder of the Hans, this is a case where the two sets of people are looking at opposing sides of the same legend. In Zhenyuan we found a more recent example of seeing two interpretations of the same set of facts. Rated as one of China’s most beautiful ancient towns, Zhenyuan has the beginning of the southern Great Wall that runs eastward to Fenghuang in neighboring Hunan province. In Zhenyuan, we were told that the wall was built by the Miaos to keep the Hans out. A few years earlier, we went to see the southern wall in Fenghuang and we were told that the wall was to keep the Miaos out--one wall, two interpretations. There are many signs and indications that Guizhou is getting ready for big time development in tourism. The roads are paved, in many cases double lanes in each direction. Some relied on switchbacks to climb and go around the many mountains but we did get on the Xiarong superhighway that was breathtakingly amazing. In a total stretch of around 400 kms, there were 163 tunnels, many over 5 km long, and most likely as many elevated flyovers, some hundreds of feet above the valley floor. This superhighway did not bend or switchback but simply went straight through mountains and soared over rivers and valleys. We were told that the construction company that built the superhighway is now working in Africa. Even in the most remote village on the mountainside, we saw satellite TV dishes and solar panels deployed for street lighting in public areas. These modern conveniences along with the superhighways will inevitably change the life style of the people in these villages. Tourism itself will affect and possibly alter the native culture of these ethnic minorities. The Ping’an village in the Longji Scenic District located in neighboring Guangxi is representative of the contradiction in tourism. Unlike the villages in Guizhou, Ping’an sitting above the mountain ridge has been long known as the place to go to see spectacular arrays of terrace rice paddies. One measure of its readiness for tourism is the fast and free wifi at the hotel and numerous coffee shops that serve real expresso rather than instant coffee. To help the tourists make the steep climb to the hotel from the mid-level where the park operated bus stops, there are middle age women ready to carry our backpacks and carry-ons up to our hotel. They can earn $5-7 for each trip up or down and on a good week, they can earn a lot more money than they can farm on the rice paddies for the year. On the other hand, if they let the paddies go uncultivated, the reason for the tourists to visit would go away. Thus it’s been necessary for the government to subsidize the farmers so that they would have the incentive to keep on farming. This is the kind of classic dilemma and trade-off between keeping a native culture pristine and buffing it for the tourist. In front of the village entrance, Zhaoxing builds a new complex consisting of a shiny flower bridge, towers and water wheels. It’s jarringly fresh looking especially compared to the old weather beaten bridges and towers inside the village. Walking through various villages, our guide repeatedly reminded us not to offer money in exchange for taking the photos of local residents. We don’t want to develop such an expectation, he said. It was a positive sign that he still had to give us the warning, which means the bad habit has not set in, but then inevitably it will. The government is trying to perpetuate the various native cultures by providing facilities for special education. We drove past a new high school campus, not quite finished that will allow Miao students to live in and focus on the studies of Miao culture, one of the major ethnic groups in this part of China. Will it be enough to preserve Miao’s ethnic identity in face of urbanization, television and lure of modernization? 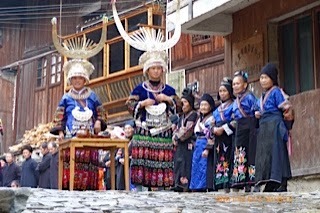 Ironically, the Miao culture does not believe in education, which may do more to slow the dissipation of their culture. Far from cultural genocide that China’s critics often like to accuse China of doing, the government policies are designed to encourage maintaining the native customs and practices. Will it be enough to keep the Miaos from going the way of American Indians, donning war paints and performing the rain dance only for fee paying tourist cameras? 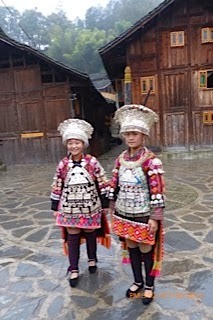 It’s hard to know at this point but my guess is that the Miao people won’t become so banal so quickly. Our itinerary was created by Dragon Delight, our tour operator. They were prompt and responsive to our queries and delivered everything they promised. The English speaking guide was excellent and exceeded our expectation. The driver was steady and conservative, important attributes for driving around the mountainous roads. Dragon Delight also offers group rate discount starting from a group as small as six, increasing the discount with increasing size. With a group of 20, the per person rate was a real bargain. 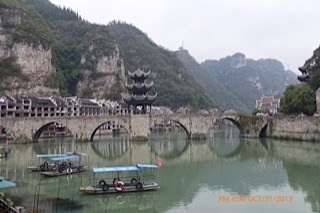 For anyone considering going based on our itinerary and has more than two weeks to spare, I would recommend extending an extra day stay at Guiyang, Zhenyuan, Libo and Zhaoxing. There are plenty to see and do in Guizhou and extra days in one place would make the tour more leisurely and enjoyable. Looks like fun! The vibrant colors are similar to the Hmong people on the other side of the mountain in Burma. Insight comments relative to people's living. Tourism brings foreign exposure and learning, and of course, income and life betterment.